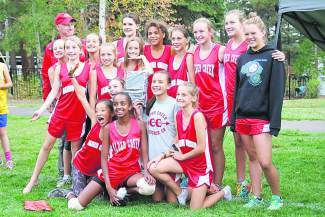 The Alder Creek girls 6/7th-grade cross-country team swept the top five spots at the Tah-Neva League championship. A sweep of the top five places in cross-country running is a rare and coveted team accomplishment, resulting in the lowest possible team score of 15 points. The Alder Creek Middle School girls 6/7th-grade team pulled off the feat at the Tah-Neva League championship meet held at Kahle State Park this past Friday. In fact, the Cougars swept on all but one regular-season meet. Leading the charge was Carly Davis, who was undefeated throughout the season and posted a finish time only 10 seconds off the course record. Teammates Kaelin Woodruff, Hana Mazur, Amelia Swanson and Caitilin Smith finished second through fifth, respectively, and during the regular season were joined by teammate Alia Sinoff as a top-five finisher. Working hard to shut down threats from behind in the field of 108 runners were Sonny Strusinski (eighth), Hayden McJunkin (11th) and Nynke Propstra (16th), with many teammates following close behind. North Tahoe’s girls finished third behind Alder Creek and South Tahoe. The Lakers were led by Kili Lehmkuhl in ninth place, Este Shaw in 10th and Ana Ting Osterhuber in 12th. The Alder Creek boys 6/7th-grade team also demonstrated strength and depth, placing second in the championship meet to a talented North Tahoe team. North Tahoe’s Etienne Bordes and Alder Creek’s Ethan Flynn led the way with 1-2 finishes in a field of 165 runners, with both runners finishing within 2 seconds of the course record. North Tahoe’s Keelan Giannini placed third and was followed by teammates Carson Lamberth (fifth), Phoenix Sanchez (sixth) and Koson Verkler (eighth). Alder Creek’s Gabe Smith (10th), Wyatt Peek (11th), Canyon Blasssingsme (12th) and Diego Rodriguez (18th) rounded out the Cougars’ top five. The Alder Creek boys 8th-grade team captured second place to South Tahoe, narrowly missing the title by two points. Montana Montgomery won the race to continue his undefeated streak from the regular season, while teammate Alan Tester was second and was followed by Hudson Bullock (10th), Aaron Bronstone (16th) and Anson Wapstra-Scott (38th). Oliver Fralick led North Tahoe in ninth place. North Tahoe’s 8th-grade girls team finished third and were led individually by Cami Carter in 11th. She was followed by Anaka Hudson (20th) and Zoe Clift (22nd). For Alder Creek, which did not have enough runners for a team score, Isabella Terrazas led the way with a second-place finish and was a consistent top finisher throughout the season. Complete results from the championship meet are available at http://www.athletic.net. — This article was submitted to Sports Editor Sylas Wright at swright@sierrasun.com. Wright contributed to the report.